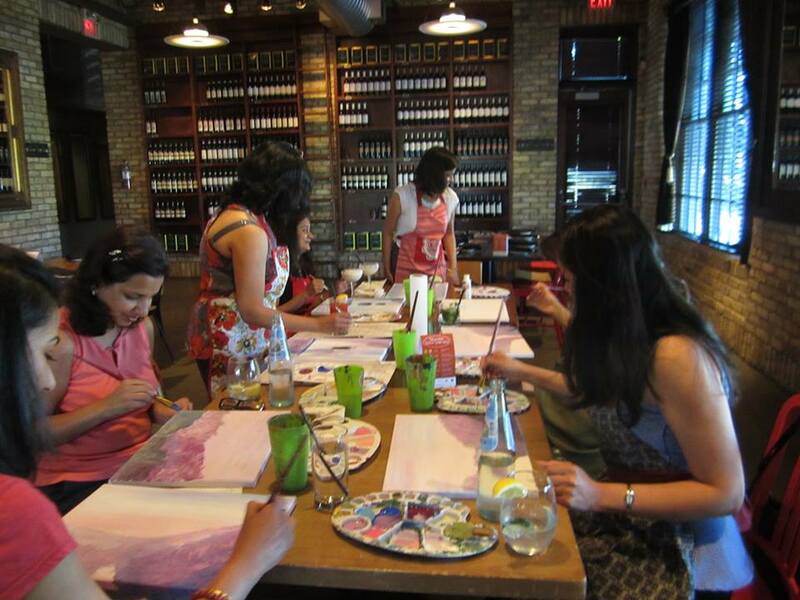 Book your next Art Party with us! 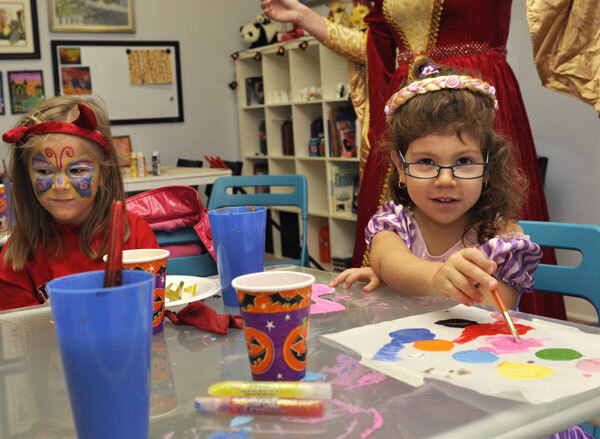 Our bright and creative studio is a perfect place to host your next birthday party, special event, or a holiday craft party! 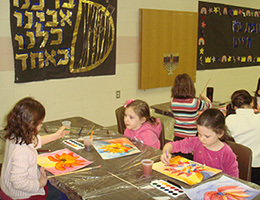 Choose from a variety of arts and crafts projects or paint-it-yourself canvas. 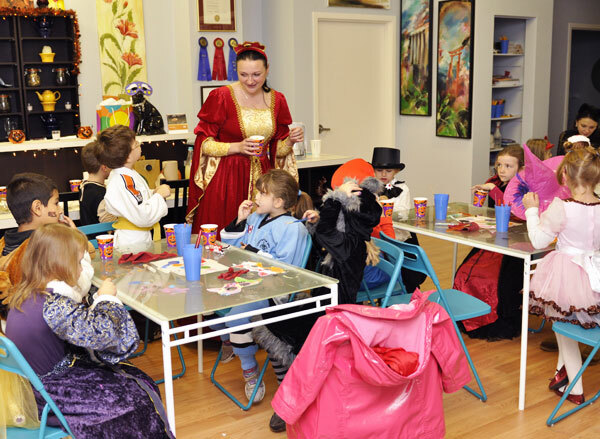 There is no booking fee, but a minimum group of 6 guests is required to reserve your party. You are also more then welcome to choose subject of the painting. 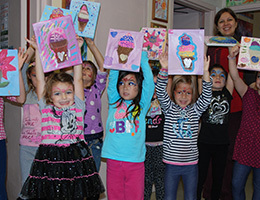 Art party-paint your canvas and face painting. 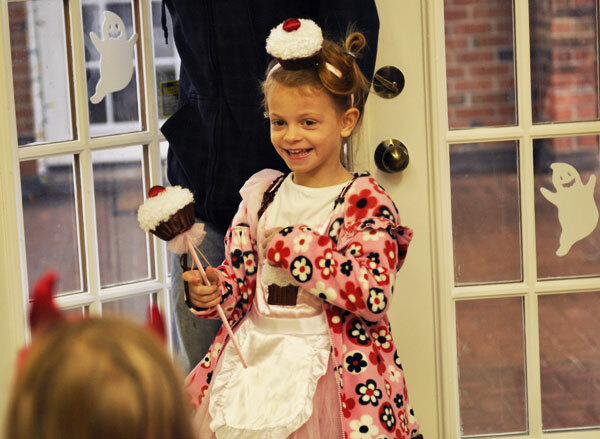 A limited time party package we are offering designed specifically children. Includes a paint instructor for the party, and all tools, paints, etc. needed to make wonderful works of art. 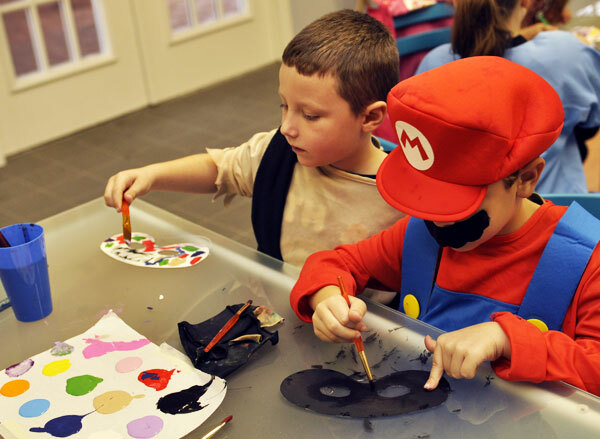 This party package uses acrylic paint to paint canvas. Canvases can be taken home the same day. You are also more then welcome to choose subject of the painting. Face painting and complementary 1 hour cake and pizza time. 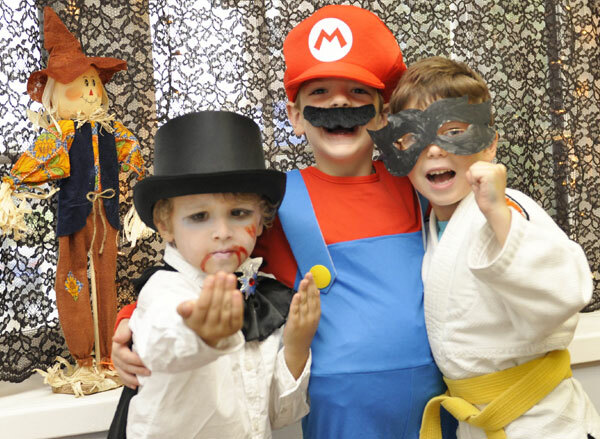 A limited time party package we are offering designed specifically children. Includes a paint instructor for the party, and all tools, paints, etc. needed to make wonderful works of art. This party package uses acrylic paint to paint canvas.You are also more then welcome to bring in your own food - pizza ,cake and etc. Canvases can be taken home the same day. You are also more then welcome to choose subject of the painting. 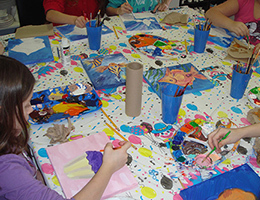 Art party-paint your canvas with acrylic, small craft, face painting. 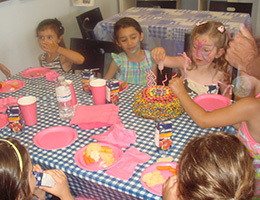 New party package we are offering designed for kids Birthday Party. Includes a paint instructor for the party, and all tools, paints, etc. needed to make wonderful works of art and craft . 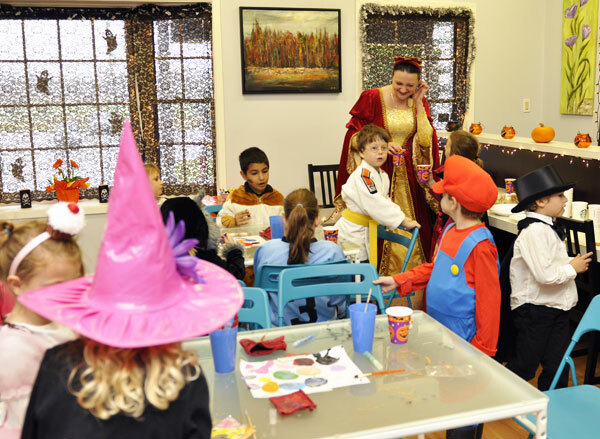 This party package uses acrylic paint to decorate, so items can be taken home the same day. You are also more then welcome to choose subject of the painting. 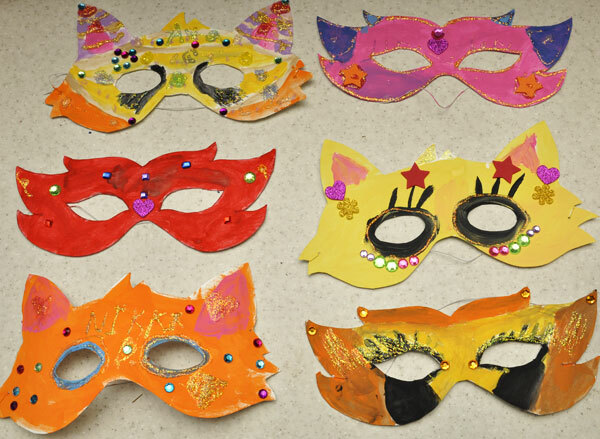 Art party-paint your canvas with acrylic, small craft, face painting and complementary 1 hour cake and pizza time. 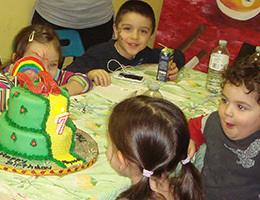 New party package we are offering designed for kids Birthday Party. Includes a paint instructor for the party, and all tools, paints, etc. needed to make wonderful works of art and craft . 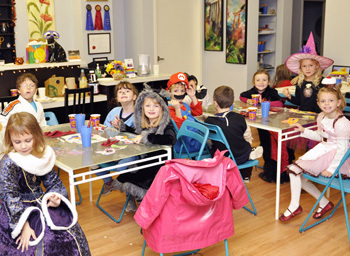 This party package uses acrylic paint to decorate, so items can be taken home the same day. You are also more then welcome to bring in your own food - pizza, cake and etc. Book your party in advance is $50 not refundable deposit fee ( date of event can be changed no later than 1 week before event). $50 cancellation fee charged if School was not informed at least 1 week an advance about change of date or cancellation . Full amount paid one week before the start of a party on our website. 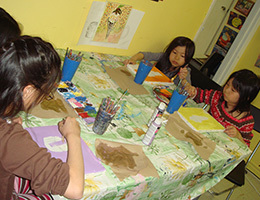 Prices start at $15 per guest for - for 1 hour Art party ( minimum 6 kids). 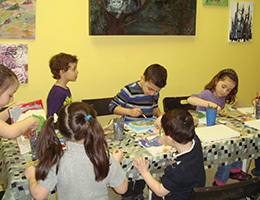 $25 - 3.5 hours party Art and Craft party, (2 hours paint yourself a canvas, art - watercolor project or craft) with face painting and small animal to paint.1,5 hour time for cake and presents- minimum 6 people,up to 15 people, gift for Birthday Boy/Girl gift paint yourself ceramic for birthday Child . Please contact us or drop by our studio to browse your party options and book your event! Please vesit our Facebook page for updated schedule. CANVAS PAINTING or WATERCOLOR EXPERIENCE for : $ 25 per person - 2 hour painting experience .$ 27 per person 2 hours painting experience + 30 minutes for food or cake. Perfect party for adults Birthdays, Bridal parties, or Corporate Events: choose landscape, abstract painting , flower painting or from catalog or examples in the stdio and you choose the structure of your party. Our Instructor will provide detailed instruction and demonstration on ceramic painting technique and will assist as required, the rest is up to you. Perfect for those wishing for a private event space.Call us for details. All parties outside of our studio $50 transportation fee applies. ADDITIONAL PARTY OPTIONS: Custom Cakes, Cupcakes and Loot Bags Available! Cakes start at $40.00 for 8 inch custom cake with name , Loot bags start a $5.00 each Call us for details! Creating art provides joy to the artist.Visit us at 55 Glen Cameron Rd, Unit 205, Thornhill, L3T 5W2. You and your child will be thrilled with our individual approach to each student. 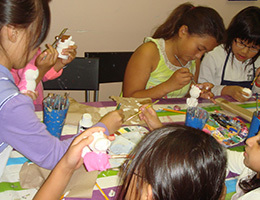 Most of the students study classical art, sculpture, painting, design, and drawing.